In order to rent one of our apartments, you must be enrolled at a higher education institution and be able to prove your student status. Young professionals who have recently completed their studies are also welcome in our residences. In order to rent accommodation in one of our residences, you must have at least one guarantor. This individual offers payment security for you and must be able to prove a certain level of solvency. Guarantors for overseas students must reside in France. Rental agreements have variable start dates between September and June. The date is determined by accommodation availability and is then arranged with the residence manager. However, during July and August, there is a mandatory rental agreement start date. If you wish to move into one of our apartments but there are none available which meet your requirements, no problem: you can make a pre-booking. To do so, all you need to do is submit your request in advance in order to secure an approval in principle before the final allocation of accommodation. Doing this will improve your chances of moving into an apartment quickly. This is payable when the agreement is signed, the deposit is equivalent to 2 months’ rent. It is cashed when the tenant moves in to the accommodation and returned within a maximum of two months following departure, minus any necessary deductions for damage identified during the departure inspection. 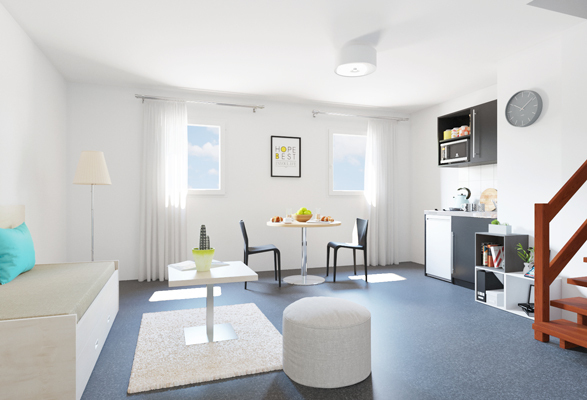 Now there’s no need to wait for your exam results before you reserve your « Les Belles Années » apartment. In the instance of not being accepted by your institution of choice or failing the baccalaureate, we will cancel your rental agreement and refund you in full, on presentation of a supporting document. The deadline for providing a response will be set in advance with the residence manager.